Tōkyō: Hayakawa Publishing INC, 1990. 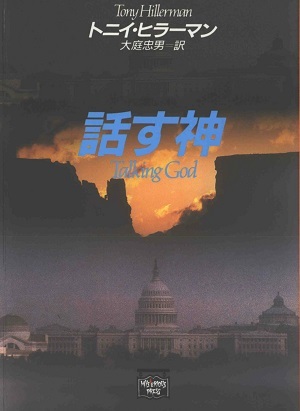 This is the first paperback Japanese edition of Talking God, the ninth book in Tony Hillerman's Navajo Mystery Series. This 1992 edition was published in Tokyo, Japan by Hayakawa Publishing, INC. This edition is also associated with the Mysterious Press, which is a trademark of Warner Brothers, INC. and was used by Hayakawa Publishing with permission. The text was translated from English to Japanese by Tadao Oba. This paperback edition has a dust jacket designed by Shiro Tatsumi, who completed the covers for several Japanese editions of Tony Hillerman novels. Format: Paperback, 15 x 10.7 cm. Binding: Two-tone grey paper covers printed in black and white. The publisher's logo, title, author, and publisher are printed vertically on the spine.